Cook Japanese rice in the three cups water. When cooked leave rice for 15 minutes. When cooked leave rice for 15 minutes to steam. Meanwhile prepare the vinegar mixture. In a pan, over low heat, blend vinegar, sugar and salt. Leave the mixture to cool at room temperature. Transfer rice into a wooden bowl. Spoon vinegar mixture over rice little by little, mixing well. Use a spatula to distribute the vinegar evenly. Cut and fold the vinegar into the rice mixture, making sure not to stir or beat the rice as this will break the grains. You may not need all the vinegar mixture. Spoon in just enough vinegar untilthe rice gets moist. You may also fan the rice or hold the rice bowl over an electric fan so excess liquid evaporates. Set rice aside. Cover bowl with a clean, moist kitchen towel if not using rice immediately. Cut a sheet of nori in half. Lay one half sheet of nori on a bamboo mat. Wt your hands with water and place a hadful of rice on the nori. With your finger, spread out rice firmly on the whole surface of the nori. Press on the rice to flatten it. Always wet your fingers to keep the rice from sticking . leave vacant about ¾ inch of one edge of the nori. Arrange the strips of kani, kampyo, takwan, tamago, and cucumber crosswise at the center of the rice. Add oborro. The assembly should look like this, although you can position the fillings in the order you desire. Lift one edge (the one filled with the rice up to the border) of the mat slightly with thumbs and forefingers while holding the fillings firmly with the other fingers. Roll the mat, pressing on it slightly to keep the filling together. Unroll the mat. The nori should be completely rooled. Keep the seam side down. 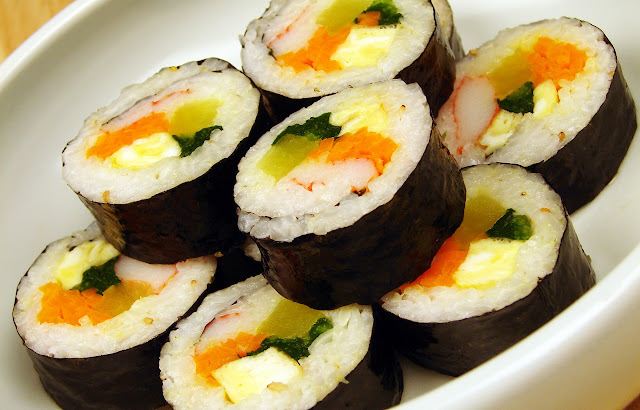 Moisten a shrap knife with water and cut the nori roll into desired thickness. Arrange sushi on a platter and serve with ginger, sushi wasabi and soy sauce. End.